Check out our upcoming workshops and events on this page. You can register to any of our workshops using the EventBrite registration links below. Public Theater returns to East NY for another FREE performance. 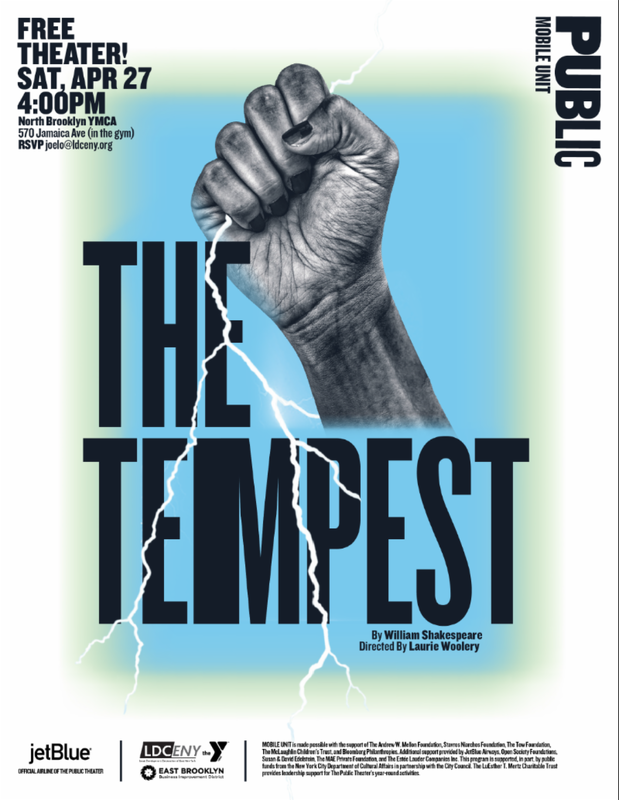 The Tempest, written by William Shakespeare and directed by Laurie Woolery, Director of Public Works, is a tale of Prospero, a powerful magician and the rightful Duchess of Milan, who has been usurped by her brother and has escaped to a remote and barren island. There, despite the unforgiving landscape, she has tried her best to make a home for her daughter, Miranda. When Prospero conjures a powerful storm to sink her brother’s ship, she must decide how to deal with him and his confederates, who have washed ashore. How will she exact her long-awaited revenge? How do you satiate a desire for justice? Join us for this free production on to find out! ​If you're interested in watching our recent business planning webinars online, please click on the link http://www.ldceny.org/presentations.html. Each webinar presentation is 2 hours. Once you have watched the webinar, we would appreciate your feedback regarding the value you obtained from the presentation. Your feedback will also help us design future content that is relevant to your business growth. Please complete our online survey www.ldceny.org/survey.html. Thank you. Funded in part through a Cooperative Agreement with the U.S. Small Business Administration. All opinions, conclusions, and/or recommendations expressed herein are those of the author(s) and do not necessarily reflect the views of the SBA. ​All SBA funded programs are extended to the public on a non-discriminatory basis. Reasonable arrangements for persons with disabilities will be made, if requested at least 2 weeks in advance by contacting 718-385-6700 ext. 18. The Local Development Corporation of East New York empowers low-to-moderate income women and minorities with programs that promote economic sufficiency, build assets and improve their lives and those of their families. We work with local businesses to retain and build industry and commerce, create jobs and improve economic opportunities for local residents and neighborhood enterprises.